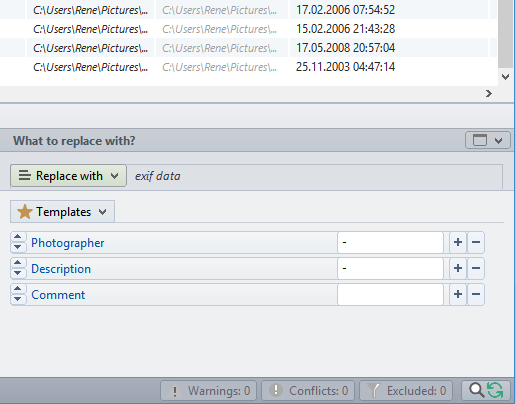 Rename Expert supports metadata such as EXIF, IPTC and ID3. By using metadata, you can organize, sort, and rename files automatically. Despite its diversity of functions, the program is very easy to use. With Rename Expert, meaningless file names are a thing of the past! The extensive filter and sort functions can be applied to many attributes (e.g., the file extension, date created, metadata like image dimensions), allowing the exclusion of files and folders. In addition to renaming, files can also be moved or copied into subfolders whose naming is based on metadata (e.g., photo taken date, artist, album, etc.). All changes are shown in real-time and checked for errors (e.g., duplicate names) to avoid possible conflicts. Metadata (EXIF, IPTC, ID3, etc.) can be used for the naming of files (e.g., for images, video files or audio files). Rename Expert can automatically rename text files based on a part of the file contents (e.g., to include data from TXT, XML, HTML, or log files). Rename Expert allows you to arbitrarily change file extensions. (e.g., jpeg to jpg). 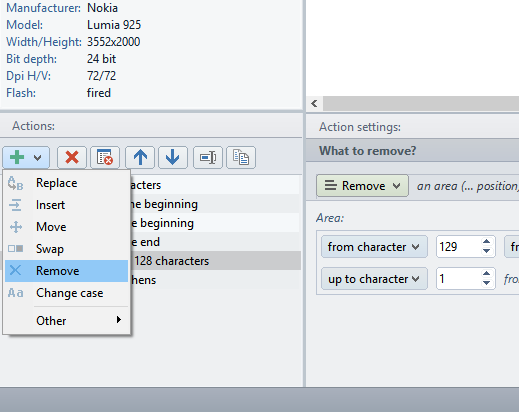 You can add, remove, rename or adjust the case of file extensions. With Rename Expert you can rename files or folders that exceed a path length of 260 characters, and therefore can no longer be edited using the Windows Explorer. Action Lists allow the combining of actions (replacing the first word, moving a part of the name, adjusting the case) and can be stored along with additional settings as a profile for repeated use. The program provides many thoughtful features to allow a flexible and comfortable renaming of files of all types (for example, music files, image files, documents, etc.). These include the replacement or exchange of certain areas in the name, or moving a part of the file name or folder name to any position. Furthermore, additional data, such as metadata, the creation or modification date, or the name of a parent folder can be included in the name. Rename Expert contains many features for advanced users and allows for example the use of regular expressions or the command line for automated renaming. Additionally, the content of text files can be used for naming, for example, the title of HTML files or values from XML files. Furthermore, the program allows the renaming and moving of files over a network. It supports Unicode file names and paths with more than 260 characters. Rename Expert can rename folders recursively, i.e., folders along with subfolders and files contained in a single step. By using the filter, the objects to be processed can be circumscribed exactly. If the new file names are already contained in a list or CSV file, you can use them for naming. In addition, you can number files and folders, insert random characters, change the case of the folder and file names and remove unwanted characters from the name. All this can be achieved in a few steps with Rename Expert. Replace, insert, move, swap, or remove name parts. Encrypt folder or file names with a password. Use hash values(MD5, SHA1, SHA256, CRC32) of the file content as part of the file name. Rename, add, remove, or change the case of file extensions. The upper and lower case of names or parts of names can be arbitrarily changed. In addition, the spelling can be specified in a list. Names of parent folders can be used for naming. Folders and files can be numbered with many settings options. Rename file and folder names as specified in CSV files. The file contents of text files can be used for the file name. Use random characters (uppercase characters, lowercase characters and/or digits) for file or folder names. Support for regexes (PERL-compatible regular expressions). Rename folders along with subfolders and contained files in a single step. 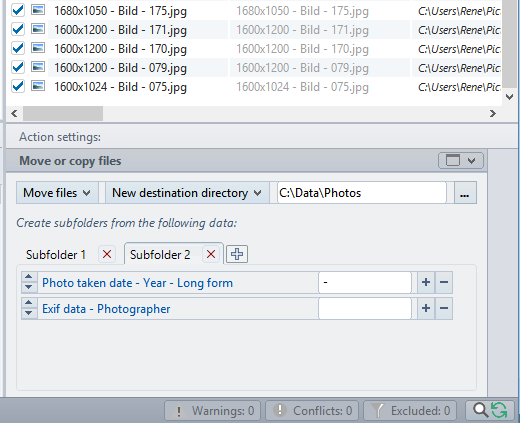 File creation date and modification date can be changed, e.g. set to the date the photo was taken or can be changed by an adjustable value. File attributes can be adjusted. Command line support, including a wizard to generate batch scripts for event-driven or time controlled renaming. Detailed view displays file properties and metadata contained. Any criteria that can become part of the name, can be used as sorting criteria (e.g., metadata, file size, modification date ...). Extensive filtering options for folder and file properties. Support for Unicode characters in file names/folder names. Moving, copying and renaming of files with full network support. Real-time preview and conflict testing of the new pathes and names. Reads files and folders with long paths (more than 260 characters). Drag & Drop support (simply drag the folders and files to be renamed onto the main window of the program). Renaming functions can be combined arbitrarily. All settings can be saved as profile for reuse. Previous names can be restored using undo and redo. Lists with file and directory names can be imported and exported. When copying or moving files, subfolders can be created dynamically from file properties (e.g., creation date, the image width ...). Copy and move files using a CSV file. Integrated tool to create folders and files automatically by specification (create files and folders from a list or numbered consecutively). Lots of templates are included (e.g., shorten names, move images into sub-folders named by image dimensions, replace the part of the name included in parentheses, create Web-safe file names, create SharePoint compliant filenames, use photo taken date as file name, use track number and title of MP3 files as file name). Metadata are descriptive information about the file's contents. Rename Expert supports many metadata, including EXIF & IPTC information stored inside digital photos. Many digital cameras store these automatically in the photos. With Rename Expert, this data can be used for the naming of photos. For example, camera model, location, or the date taken of photos can be added to the file name. Furthermore title information contained in audio files, for example, in MP3 files, can be used to rename the music collection in a uniform manner. For the file name of documents, for example, the author or the subject may be used. EXIF data (photo taken date, camera manufacturer, camera model, photographer, description, commentary, image width/height, horizontal/vertical resolution, flash use). Image data (width, height, horizontal/vertical resolution, bit depth). Audio data (artist, album, title, year, comment, track, genre, bit rate, album artist, composer, disc number). IPTC data (country, country code, state, city, location, title, photographer, description, provider, source). PDF data (version, author, title, subject, keywords, creator, producer, page count). Video data (date encoded, width, height, frame rate, standard, aspect ratio, audio codec, video codec, overall bitrate, video bitrate, audio bitrate, audio compression, duration, title). Document data (authors, title, subject, comments, tags, last saved by, revision number, template, content created, date last saved, last printed, program name, pages, words, characters) - supports XPS files, Word files, Excel files, PowerPoint files, OpenDocument files (e.g., Microsoft Office, OpenOffice or LibreOffice). Email data (date submitted, subject, sender name, sender address, sender domain, recipient name, recipient address, recipient domain). FindMySoft: With its numerous renaming rules, real-time preview, support for Profiles, and undo function, Rename Expert is an exquisite tool for batch renaming files and folders. Shareware: Rename Expert stands out from many other Renamers. A sensible range of possible actions, together with programmable action lists making the repeated use particularly easy, and the airy user interface ensures a good feeling. Winportal: Rename Expert is really easy to use and includes many useful features. Apart from working in batch mode, you can also use this program to move files to a folder with a name based on the metadata, and you can number all files in that folder. 3d2f: Rename Expert is a lot more than just a renaming tool. It’s a multifunctional file management solution with an emphasis on renaming and a bunch of powerful features that will help you manage your files with a level of efficiency you never thought possible! Software Informer: Rename Expert has been designed to give you the highest level of flexibility possible – it offers you all the tools and features that you will ever need to change filenames, folders and subfolders names, and even extensions in a clever and logical way.